Speed is the name of the game in this fast-paced world, where climbing the ladder of success is a race and being slow risks falling and failing. As such, people have learned to multi-task, and the same is now true when we eat. True enough, we tend to order quick food and eat it just as fast. Often so we can immediately go back to work. What we fail to realize is that eating fast actually harms us more than we think. It’s not just what we eat that we should focus on, it’s how we eat as well. This stems from our body’s innate gut physiology. Digestion is the process wherein our body breaks down the food we eat and absorb the nutrients that are stored within. While it’s certainly understandable that this process starts from the moment we take in food, we should realize that it actually starts way before that. Believe it or not, the process of digestion actually begins the moment we see food. This is called the “cephalic” phase. The cephalic phase starts in the mind. Upon the mere sight of food, signals from the brain trigger different reactions within our body to stimulate the release of a hormone called ghrelin. This hormone signals hunger and initiates another cascade of bodily processes which begin with increased saliva and gastric acid production. Essentially, the mind is preparing the body to eat. From here, once a person finally gets to eat food, the second phase, called the “gastric” phase, begins. This is when the actual digestion takes place and that steak and mashed potatoes we just munched on gets broken into many small pieces so our cells can extract the nutrients within. Once our cells are satisfied, they send a signal for the release of the hormone leptin, which tells our brains that we are now full. This stops the production of the hunger hormone and we feel full. The gastric phase normally lasts around an hour from the actual digestion to the release of leptin. From here, it’s now easy to see that when we overeat in a small amount of time, we actually neglect to give our body enough time to absorb the food we ate and give our body the chance to release our satiety hormones. Hence, we develop an urge to overeat. This phenomenon has been seen in numerous studies. 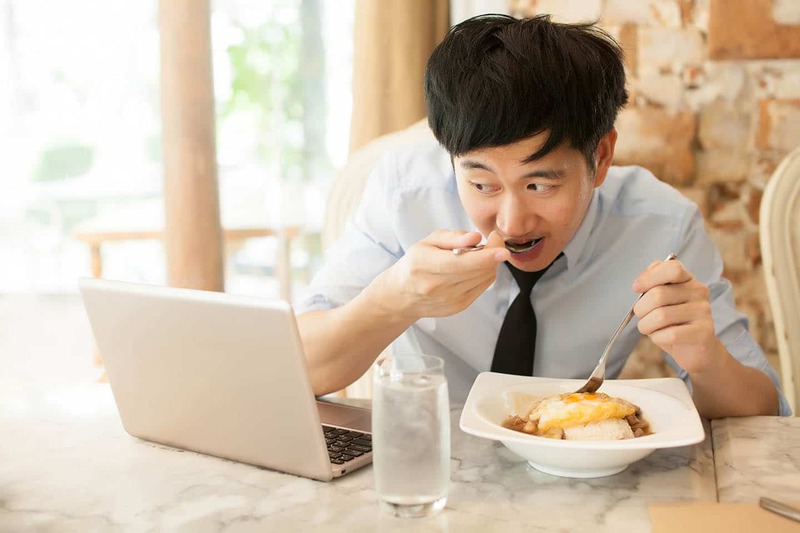 According to a study conducted by Nagoya University’s Graduate School of Medicine, it has been found that eating too quickly presented a high risk for developing obesity, especially among middle-aged individuals – people who are more likely to be at the peak of their careers and living the fast-paced lifestyle. The science and the evidence are there: eating too quickly leads to overeating and obesity. Now, it’s a matter of how you take this information and apply it in your life to live a healthier life. Indeed, not everything is a race, especially when it comes to our eating.